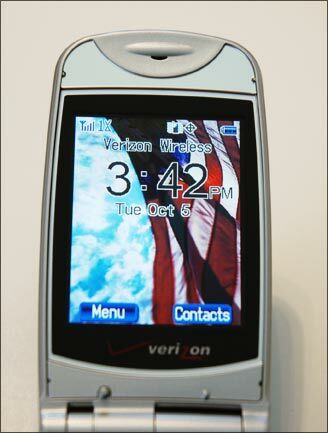 Verizon Wireless launched the Audiovox CDM-9900 just last week, but we have heard a lot of buzz about this phone already. MobileTracker has a 9900 in the office and will provide a full review shortly, but we've taken a few photos to post before the review. 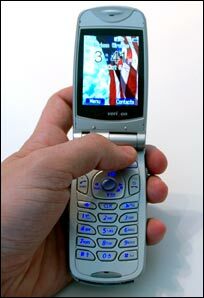 The screen is the main attraction to this phone, 240�320 pixels (QVGA resolution) with 260,000 colors. It's really bright too. The photos start after the jump. Yes, the screen really does appear this bright in indoor lighting. Everyone that has seen it has been surprised at the brightness and clarity. 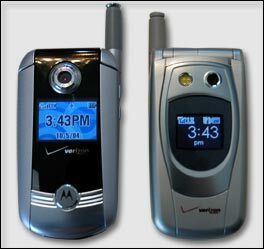 This image compares the Motorola V710 (seen on left) with the Audiovox CDM-9900.